Now add to THAT the fact that we don’t have a dishwasher. Anyway, you get the picture. 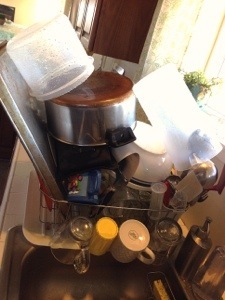 And in this picture, you can see how I’ve so artfully stacked upon stacked the freshly-washed dishes upon dishes. My family can’t stand it. They think it’s really annoying how many dishes I cram into that biggest-I-could-find dish drainer. But when we go through as many dishes as we do every day, you HAVE to cram it and stack it or you would be able to keep up even less than we already can! My three oldest boys are on a revolving chore chart which we rotate weekly. We lump a few chores together for each. Being on the Dishes section is the most disliked chore by far, and they dread it. I usually help them do their dishes because I know how daunting it can be — and how quickly it can become overwhelming if you don’t keep up. And sometimes I’ll make a trade with them, like: I will do a load of dishes for them if they do laundry for me, or something like that. I know — Mike empathizes! !